Home » Blog » Cow Dog Stories » Do As I Say, Not As I Do! I went to gather about 25 head of steers and heifers the other day, each of them probably weighing in at 1000 pounds or more. I called my friend Rick and asked him to come along. 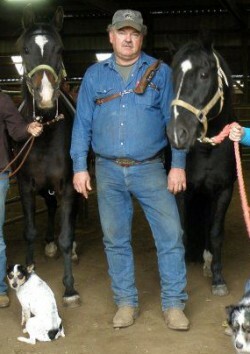 I brought my two best dogs, Tyson and Hangin’ Tree Trap, a young dog for some training and I even brought an extra horse for Rick to ride. I also told Rick to bring along his dog Maggie because I knew it was going to be a fight to get those steers and heifers out of the swamp and tall grass. When Rick showed up I told him whatever you do, if your horse stops, “look” to see what’s ahead because it might be a spring. We were having a hard time getting the cattle out of the brush. The young dog kept circling the cattle and holding them up. The dogs finally got them stopped when my phone rang. Since it was someone I really needed to talk to, I answered. About the time I answered the phone my horse stopped. Not thinking about what I was doing I bumped him with my heels and like the well-broke horse that he is, he went forward. Unfortunately, he went forward into a spring and sunk to his belly in bog water. When his chin hit the ground I was rolled off to one side but I sure as heck held my phone up high! Phones cost a lot of money! When my horse got out of the mud and I caught up with Rick who was sitting on his horse on top of the hill, I asked if he saw what happened. He said yes and he sure wished he had his camera with him! I’m sure glad he didn’t that time! I hear all the time “no cell phones while you are driving” I guess that goes for riding also.